Give us a call at 407-733-8623 to make your armadillo problems a memory. 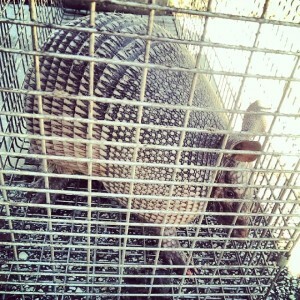 Florida Wildlife Busters are your local experts in Armadillo Removal. Basic armadillo removal services at a flat rate of $200.00. Call us now at 407-733-8623. Of the more than ten species of armadillo found worldwide, the nine-banded armadillo is the only one in North America. It has moved up into the states through Mexico and Central America from South America and is now commonly found throughout more than half of the country. They’re an invasive species and are amongst the “least concern” on the International Union for the Conservation of Nature’s conservation status list. In Florida, the armadillo is mostly unchecked. Their only local natural predator is the coyote, which they greatly outnumber and the armadillo is much more likely to lose its life under the wheel of a moving vehicle than a larger animal. Considered a “medium-sized” mammal, armadillos typically grow 25-42 inches long and weigh 5.5 to 14 lbs but can be found up to 22 lbs. A single armadillo may create and maintain up to 12 burrows within its territory (approximately 1 mile). These burrows will get deeper and longer during every visit until they reach about 7 feet deep and 25 feet long. Left alone, tunnels like these can essentially become small sinkholes under gardens, patio decks, or foundations. Aside from damage to property, armadillos are the only animal, other than humans, that are known carriers of leprosy. Leprosy, or Hansen’s Disease, is a seriously debilitating ailment and, albeit rare, more than half of new cases are found in the states of California, Florida, Hawaii, Louisiana, Massachusetts, New York and Texas. The good news is: regardless of which critters may be causing you distress, Florida Wildlife Busters is capable of quickly determining your problem and effectively solving it. Armadillo removal isn’t easy for anyone, but we are highly experienced and capable of finding the appropriate pathways and picking the correct areas for trap placement to rid your yard of armadillos.